Detail from Sandra Sawatsky's "The Black Gold Tapestry." This is the second post in a series on “Canada’s Anthropocene,” with posts and a roundtable by Pamela Banting, Ashlee Cunsolo, Alan MacEachern, and Joshua MacFadyen. To read the entire series, click here. In her novel Station Eleven (2014), expatriate Canadian novelist Emily St. John Mandel explores what might happen if a pandemic swept through Toronto and circulated around the globe. One day it is business as usual: people go to work, attend a play in the evening, and have every reason to expect that the next day will more or less conform to their expectations and routine. However, that night people start dropping like flies. The novel has two storylines and therefore two opening scenes. In the first, an actor playing King Lear suffers a heart attack and dies suddenly on stage mid-performance. In the second, Jeevan, a paramedic-in-training who rushes to the stage to assist when Lear falters, receives information via a doctor friend that a lethal flu is sweeping through local hospitals. Jeevan goes immediately to a grocery store, fills seven shopping carts with food and supplies, and with considerable effort manages to get all of them through the snow to the apartment of his wheelchair-bound brother Frank. The brothers survive on the cache for quite a while but eventually realize they will have to leave their fortification if they are to survive. Rampant denial of climate change and other problems posed by the Anthropocene is a dire and perplexing problem in Canada. We are confronted with a spectre that resembles nothing so much as an episode of The Bugs Bunny / Road Runner Hour in which Wile E. Coyote ardently saws through the branch to which he is clinging over a yawning abyss. Any pre-school child can see through the faulty logic in that cartoon, and yet far too many adult Canadians seem to see nothing terribly wrong with sawing off the ecosystems – clean air and water, productive soil, populations (even whole species) of wild animals, forests, ocean – that underwrite our prosperity and support our very existence. It is as if we Canadians have individually and collectively decided that the Anthropocene, if there is going to be one, will proceed only through long, gradual, barely perceptible change over many generations. We take on faith that “They” – that vague pronoun to which we resort when we imagine just-in-time techno-scientific help or that imaginary, implacable force called Progress – will surely develop new seeds or entirely new crops that will tolerate wild swings of temperature, moisture, and wind almost the way plastic seems to “survive” whatever vicissitudes it encounters. As Australian professor of climate change and public ethics Clive Hamilton writes, “the principal assumption of the contemporary world, that of endless progress, now looks untenable. We are inclined to forget how deeply entrenched this assumption is; it is the grand narrative that will not die, the storyline of daily decision making in public, corporate and private life.” The episodic narrative of continual progress (think of the omnipresent tag phrase “moving forward”) makes us oblivious as to how suddenly everything can change. It is possible too that because the Anthropocene is figured as a new geological epoch we have the false confidence that there will be lots of time to change and adapt in the future – that is, in someone else’s lifetime. After all, the Holocene lasted about 11,500 years. This thinking is tantamount to a temporal version of NIMBY: Not In My Lifetime. To translate this into my discipline, literary studies, we think we are living in a big, fat Victorian triple-decker novel – or maybe the entire literary canon – whereas we might actually be living in a skinny volume of terrifyingly experimental poetry. Peripeteia is the term for the narrative device associated with the central point around which traditional narrative structure pivots, the term associated with my title, “Suddenly.” It is the abrupt turn of events, the unanticipated reversal of fortune, particularly in tragedy and epic. In rhetorical handbooks, the classic example of peripeteia is the moment in Oedipus Rex when Oedipus discovers that he has blindly fulfilled the prophecy that he would kill his father and marry his mother. I am using the term here in a more generalized sense as the ‘turning point’ in our individual and collective cultural narratives. According to Peter Childs and Roger Fowler, structuralist / formalist narrative analysis has tended to highlight only “the sequential relations between episodes and neglects the essential [Aristotelian] relations of ‘complication’ and ‘denouement’, such as their mirror-like opposition in intensity and result, a patterning which is preserved in the traditional ‘trajectory’ metaphor.” Equally important, in my opinion, is the fact that the reader’s horizon of narrative expectations hinges on the assumption that pre-existing the story is a state of homeostatic equilibrium. As Childs and Fowler write, “Most models of narrative structure start by assuming a previous state of rest or equilibrium or normality which is disturbed by an outside force of some kind.” When a second force comes to bear on the situation, it reverses the process and “allows for the gradual resumption of normality or the establishment of a new equilibrium.” A better description of privilege – a previous state of rest, equilibrium or normality and the expectation of a return to that state – and the background conditions for denial would be hard to find. 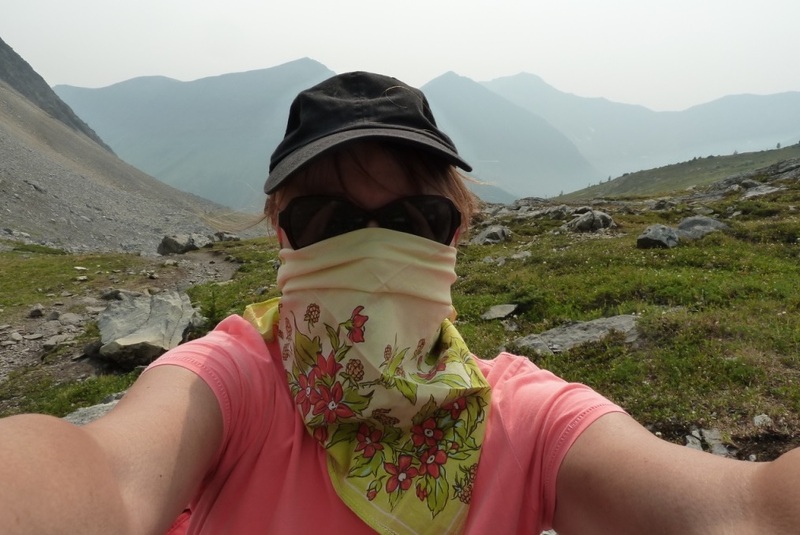 The author, hiking in Kananaskis, Alberta during a long & smoky wildfire season, 2017. What we may discover, though, is that our long-standing narrative patterns and expectations are not rooted in middle-class, capitalist, settler heteronormativity alone but are also what might be called Holocenic narrative patterns. In narratological terms, what is at stake in the Anthropocene is not only the climax of the story – the tipping point, the moment of peak everything – but that backdrop of normalcy against which we think we can perceive distinct linear events unfolding gradually and episodically rather than quickly and convergently. While we wait for the climax so we can be certain how it is all going to turn out before we act, the backdrop of Holocene equilibrium is falling away from the story. Holocene weather patterns: gone. Infrastructure: degraded or sluiced away. Water quality: not your grandma’s water. Food quality and security: precarious. Society: ungovernable. Stories in the Anthropocene – novels and everyday anecdotes alike – may take on a ragged, even jagged, form that we may not even be equipped to discern in relation to the classic narrative arc that shapes our current notions of event, cause and effect, and temporal scale. Only against the setting of the “Holo(s)cenery” can our expectation of a return to the status quo be satisfied: the various tipping points, feedback loops, and cascading catastrophes that scientists have identified and predicted will not allow for a return to normalcy, except insofar as catastrophe becomes the new normal. Despite the proliferation of metaphors and models pertaining to loops, cycles, systems, networks, webs, rhizomes, roots and branches, trees, circuits, watersheds, and so on, we still tend to think in terms of simple causes leading to similarly simple effects. People become frustrated when complexity insinuates itself. Unwanted complexity can make us feel as if reality has suddenly become a giant whack-a-mole game: just as you hammer one problem down, another rears its ugly head. Sooner or later one tires of the game and walks away, the moles triumphant. To put it another way, mainstream Canadian culture’s stories and our narrative expectations are jamming our ability to acknowledge and respond sanely to global climate change and the many other environmental problems of the Anthropocene. We are determined to invest our narratorial faith in regularity, stability, continuity, uniformity, the status quo, routine, and even boredom, rather than in complexity. We are more in sync with the factory assembly line or the imperturbable rhythm of the pumpjack. 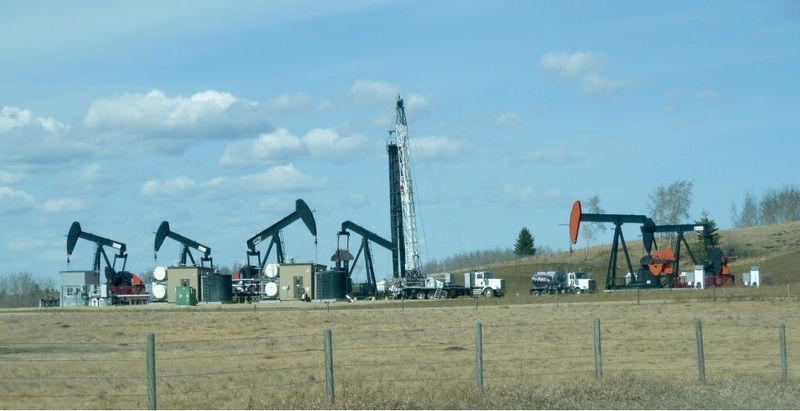 Fracking near Calgary, Alberta, 2017. Until suddenly, there is a tipping point, a shock, a peripeteia. Suddenly a normal flu season becomes a deadly pandemic, as in Station Eleven. Or the California aquifers are depleted, or the cost of fuel for trucking the produce exceeds the profit that can be squeezed from grapefruit and wrung from heads of lettuce. Or suddenly the bees do die out exactly as we had already been warned and one-third of our groceries vanish before they can be loaded onto the truck, before they can be harvested, before they can even come to fruition. Non-indigenous Canadians may not fare as well as we project as the Anthropocene continues to unfold. We have a long history – far longer than the 150 years celebrated officially in 2017 – and a great deal of practice in the discourses, instruments and institutions of denial, specifically denial of indigenous title and rights. Denying our history and circumventing our own treaties, laws and policies enable and facilitate other forms of denial and as such are inextricably linked with denial of climate change. The national cultural industry and individual pastime of denying our history has produced many citizens who are insensible to the land and its peoples, rhythms and rituals, languages, stories, animals, and plants. We are more toques, canoes, beer, taxes, and hockey sticks and less redress, sovereignty, reconciliation, and restoration. In fact, there are two non-concurrent Anthropocenes in Canada. Indigenous people in Canada have been living in one that can be clocked back to more than four hundred years ago, while a second one is looming that has only just begun to afflict non-indigenous Canadians. This second Anthropocene will happen or rather appear to happen “suddenly” because we have not been paying attention to the land’s own systems, exigencies, needs, and desires and those of its original inhabitants and rightful owners. More accurately, it is not only that we non-indigenous Canadians have not been paying attention (though we haven’t) but rather that we and our predecessors have been and still are the perpetrators and beneficiaries of colonialism, and colonialism is increasingly being correlated historically and causally with the Anthropocene. The first and the second Anthropocene are the same one, but the second comes with karma. In this sense, reconciliation (to use the omnibus term) could be a sudden, positive turning point: it could be the peripateia that might spur Canada’s will to meet or exceed our climate targets while simultaneously instituting environmental and social justice for all. Without reconciliation, on the other hand, there can be no turning point for us: instead of an eleventh-hour turning point we will have a tipping point and a wholly unsatisfactory dénouement, an unknotting or unravelling. Once the pandemic has wreaked its havoc, the actors and musicians in Station Eleven quickly find themselves in the position of having to improvise new as well as old ways of staying alive. Improvisation is one of the best responses to change: although artists do not have a monopoly on creativity or improvisation, it is not insignificant that the author peoples her post-apocalyptic novel with artists. What tends to get overlooked while carrying out the constant, demanding work of denial is the opportunity to improvise – to invent, rethink, imagine, dream, scheme, dialogue, collaborate, learn, design, draft, experiment, plan, build, try, sing, dance, sketch, visit, tell stories, write, perform, act, engage, grow things. We need to start improvising now, but we can do so only by first locating ourselves as characters and actors – not just as members of the audience or voyeurs – in the story so far. By genuinely, actively, and collaboratively acknowledging, respecting, honouring, and getting to know the land, learning about its inhabitants and their languages and cultural practices, and by researching and facing our own simple and complex complicity in wrecking it, we could change our “once upon a time,” “rags-to-riches,” “this land is my land,” and maybe even our apocalyptic stories to more life-affirming narratives. If the dogged, dirty work of colonialism got us into this Anthropocene mess, then maybe the work of re-storying and restoring the health of the land, water, air, and places will allow us to un-wreck it and in so doing help to put more than seven shopping carts between us and disaster. Emily St. John Mandel, Station Eleven (Toronto: HarperCollins, 2014), 31. Referring to the relative absence of discussion in the US of pending fossil fuel depletion and its dramatic, wide-ranging effects, with his characteristic sarcasm James Howard Kunstler writes that “One faction of so-called ‘cornucopians’ asserts that humankind’s demonstrated technical ingenuity will overcome the facts of geology. . . . Some cornucopians believe that oil is not fossilized, liquefied organic matter but rather a naturally occurring mineral substance that exists in endless abundance at the earth’s deep interior like the creamy nougat of a bonbon.” Kunstler, The Long Emergency: Surviving the End of Oil, Climate Change, and Other Converging Catastrophes of the Twenty-First Century (New York: Grove P, 2005), 4. Of course, “they” are primarily those university professors across the disciplines who could be working on reversals or mitigations of climate change or proposing and drafting alternative, transitional social infrastructures but who, in the present tense, are sometimes resented by “tax payers” (formerly known as “citizens” or “we, the people”) unless they are toiling and moiling away at separating the clay fines from the effluent in the tailings ponds. Plastic objects and a cartoon character such as the ironically named Wile E. may be our new role models. Clive Hamilton, “Human Destiny in the Anthropocene,” The Anthropocene and the Global Environmental Crisis: Rethinking Modernity in a New Epoch, eds. Clive Hamilton, Christophe Bonneuil, and François Gemenne (London and New York: Routledge, 2015), 36. Peter Childs and Roger Fowler, “Narrative Structure,” The Routledge Dictionary of Literary Terms (London: Routledge, 2006), 150. As Adele Perry writes in reference to the Shoal Lake, Manitoba water situation, “Colonialism is literally in our pipes, and promises cannot easily redirect that.” “Water and the Infrastructure of Colonialism,” The Otter blog, 23 October 2017. Pamela Banting’s recent teaching and publications are in the areas of petrocultural studies, geopoetics, literature of Anthropocene, psychogeography, and animality. Recent articles include “Ecocriticism in Canada” in The Oxford Handbook of Canadian Literature (2016); “Walking Through Lightning: A Peripatetic Bioregional Reading of a Novel,”PAN: Philosophy, Activism, Nature (2016); and “Anim-Oils: Wild Animals in Petrocultural Landscapes,” On Active Grounds, Rob Boschman and Mario Trono, eds., WLUP, in press. Excellent post. Many thanks. Would Anthropocene stories acted in embodied dramatic narratives and contemporary theatrical environments be a possible means of reaching beyond the imaginative limitations of the Holocene? Thank you for your kind comment and question, Randall Martin. I absolutely do think Anthropocene stories performed dramatically would reach beyond the limitations of our Holocene thinking and reactions. I think, for example, of the play SEEDS by Montreal-based actor and playwright Annabel Soutar, about the case of Monsanto v. Percy Schmeiser, and plays by my good friend Gordon Pengilly, and many others. I think reading literature and exposing oneself to dramatic productions change people, even if they don’t particularly want to be changed. The arts in general, as with any significant experience, change and re-arrange us, even if cognitively we think we would like to resist and since theatre is an embodied art form and in attending a play one has to physically go to the theatre it may be even more effective. Certainly Bruno Latour must think so too: he was in Calgary as part of Mount Royal University’s Under Western Skies Conference and brought his theatre company Gaia Global Circus.